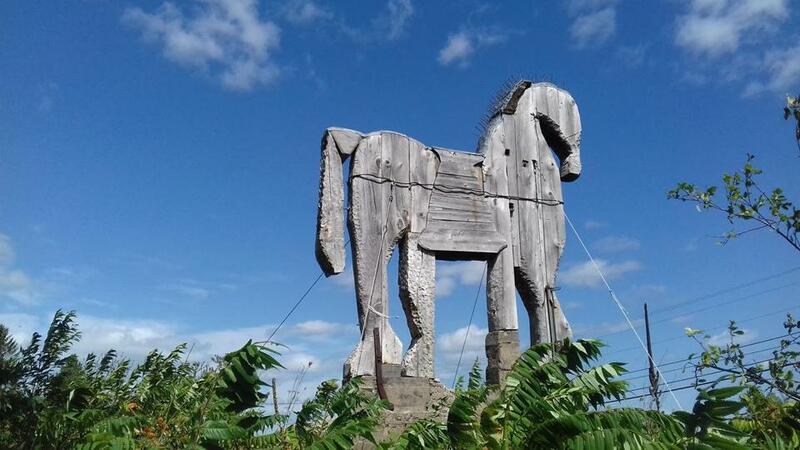 The Langlais Sculpture Preserve in Cushing, Maine, features a variety of work including a large Trojan horse. CUSHING, Maine — Catherine and Evelyn LaCasse couldn’t have said it better when they let out high-pitched screams of delight as they raced over to a cluster of life-size wooden bears. The children, ages 2 and 9, respectively, gaped at the towering black and white creatures, then headed off to greet a minimalist cow and boxy elephant, reaching for its thick legs and trunk. The girls, with their mother, Melissa LaCasse, were checking out the Langlais Sculpture Preserve, a nature and sculpture park that celebrates the work of the late carver and sculptor Bernard Langlais (pronounced LANG-lee), who lived and worked here from 1966 until 1977, when he died at 56. Born in Old Town in 1921, he had enjoyed a relatively successful career in New York as a portraitist and landscape painter, but became disenchanted with the art scene. After arriving in Maine, he turned to more down-home art, mostly rough-hewn carvings of animals, creatures, and occasional people, much of it then scattered throughout the 90-acre estate. After he died, his wife, Helen, became caretaker of his studio and hundreds of pieces of work. Up until she died in 2010, she changed little in their modest shingle house, studio, and outbuildings, and donated it all to Colby College Museum of Art. Colby in turn worked with the Kohler Foundation in Wisconsin on a four-year project to restore some of the work. Hundreds of other pieces were distributed to public sites throughout the state of Maine as part of the Langlais Art Trail (www.langlaisarttrail.org). Colby transferred the estate to Georges River Land Trust in Cushing, which owns and manages the sculpture preserve. On the side of River Road opposite the house, the relatively narrow tract of land on the Cushing peninsula reaches St. George River, with the remaining 70 acres around and behind the home. It is here, among ponds, woodlands, meadows, and apple trees that Langlais built his sculptures. The property also includes his home, studio, workshop, and barn, which are open for special occasions. Visible from the road is a massive Trojan horse that has guarded the driveway for decades, part of a dozen large-scaled conserved sculptures can be seen along or nearby an accessible quarter-mile meandering nature trail. Sculptures range from the sly “Local Girl,” Langlais’s nod to former neighbor Christina Olson, featured in Andrew Wyeth’s 1948 masterpiece “Christina’s World” (unlike the painting, viewers can see her face) to a fantastical jungle relief featuring carvings of elephants, giraffes, monkeys, and rhinos. LaCasse also appreciated the setting and that her daughters could blend natural sights with art. 576 River Road, Cushing, Maine.